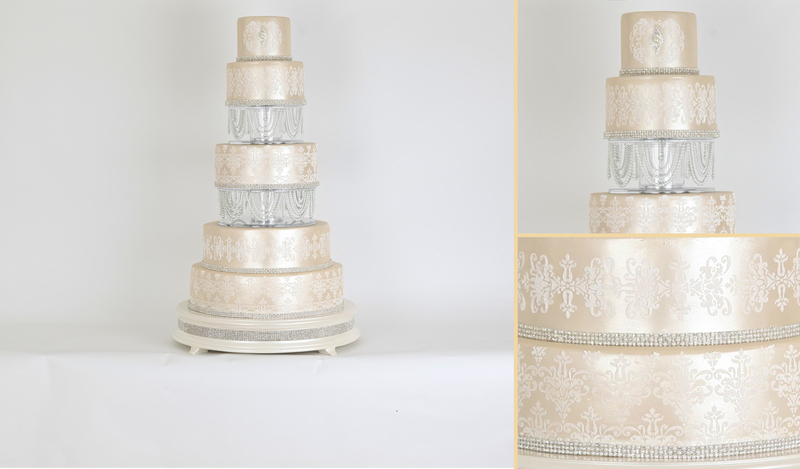 Sweet Hollywood London based wedding cake makers present Damask & Pearls Wedding Cake. This five tier wedding cake was a bespoke design created for our clients who had a champagne and pearls coloured wedding theme. The colours and theme were beautifully incorporated within the wedding cake design and the design can be customised to match your theme or outfit. Furthermore this and other cakes can be made Egg Free Wedding Cake / Eggless Wedding Cake to suit your dietary requirements.